Rainy days and Mondays always get me down too. ESPECIALLY when it involves an all day trip to my favorite place in the world, Sloan NYC! I was dreading going to this scan all weekend. Some things came up in the last few weeks that immediately throw me in to panic mode that there’s something wrong. I was having pain when swallowing food of any kind, my chest felt sore right at the bottom of my rib cage. It seems like when I get closer and closer to the scan dates any little irritation is magnified and bad thoughts pop up the second I feel anything out of the ordinary….welcome to scanxiety. It was to the point of feeling maybe I should check myself in to the Emergency room at Sloan in the city to try and convince them I needed my CAT scans IMMEDIATELY! It’s a long train ride in…..Just as I reach the tunnel to go under ground for the final stretch to Penn Station it starts raining! Great! As I emerged from underground to make my way to the office for the scans that feeling of dread gets heavier…besides having to drink a quart of horrible fluid for contrast during the scan the thoughts keep lurking in the back of my head that there could be something wrong this time. Those pains I had, feelings of something wrong and just that ‘ol angst again. I attend monthly, online meetings for Sarcoma patients through Sloan. It’s heart breaking hearing from people who joined the group because they had a recurrence and the people that are newly diagnosed. Some need to have another surgery, they need to get chemo AGAIN or try another treatment because the current one isn’t working. I can’t imagine having to deal with that again. So far I have been so lucky to have things turn out the way they have. I also don’t think I have ever said that here, or anywhere, in fear of jinxing myself and having it recur. There is nothing worse than sitting in a waiting room drinking a disgusting cocktail of contrast stairing at people in far worse condition than I am then having to wait for the results of the scans. This time it’s 2 1/2 hours between the scans and getting the results. So after the scan I had time to kill. I finally get to eat something. Wander around Barnes & Noble then finally head up to the 11th floor on 53rd St. Sloan to get the results……I check in at the front desk, prepare for the usual hour long wait. I got the false sense of them getting to me quickly because the receptionist called my name but its just to take me in for vitals. After the nurse finshes with all my info and I head back out to the waiting room to plug in my phone charger. Just then I looked up to see Dr. Gounder, my oncologist, walking over towards me. I instantly think oh no, he’s coming out to get me personally. This never happens. What’s going on? Why would he come out to get me instead of the nurse? However, his first words, right in the waiting area are “The scans are fine”!! Holy cow, what a relief….he just wanted to bring me back to his office because all the rooms were full and it will only take a minute to deliver the good news! So not only am I relived to hear everything is ok he suggests no more scans for another year… NO SCANS FOR YOU! COME BACK, ONE YEAR!! I think I have mentioned before that not having to get these scans done is a double edged sword. Yes, I hate getting them. However, I hate not knowing if there is something growing inside of me that should’nt be. At this point I feel I will accept the one year schedule. I can always go in earlier if I feel the need. The first time the doctors mentioned taking more time between scans I was terrified to go that long bewteen them. Now I feel like it makes more sense to take their advice and not be exposed to the radiation and contrast dye so often. So, no more scans, of the upper body anyway, for a year! It’s been a long road to reach this point. All I can say is WHEW!!!!!!! a feeling of deep anxiety or dread, typically an unfocused one about the human condition. I know its been a while since the last update. There is only one thing I can say about that….There hasn’t been much to say. As another one of my favorite songs from the 70’s that was played on Dr. Demento says: “I’d have wrote you a letter but I couldnt spell *%$@##! and that’s all I got to say.” There really hasnt been much else to say about everything but that…It really sums up all my thoughts about the whole experience! I wish I had something more inspiring or interesting to write or tell you about. I felt like I needed to vent a little bit and let you all know everything is going well. I really can’t ask for much better in the way things have played out. Every month I attend an online meeting through Sloan for Sarcoma patients. We all haved joked about how lucky we are to have got Sarcoma. In a way it has been a blessing. If you’re going to get cancer it is better to have a type that is not nearly as deadly as others can be. Although is heartbreaking to hear about people that have had recurrences or some sort of matastasis it is even worse to hear of people that have not survived some other form of cancer. I’m not religious at all but I came across a song from a southern gospel group called the Legacy Five that is very fitting…The chorus goes “when you wake up in the morning no matter how you hurt, be glad you’re still alive and on the right side of the dirt”. Music and videos are a big part of these updates…I hope you get a chance to listen to and watch them…let me know if you like them. Thanks for reading. May you all be NED! I’ll tell you why “I Don’t Like Mondays”! I had done my part: Arrived by 9:30 AM at 300 E 66th Street, filled out the usual mound of paperwork that could easily have been done with one check mark in a box marked “Has anything changed since your last visit?” __ NO. So I sit patiently fully expecting them to do their part and get me my MRI AT 10AM!! 10:30 comes and goes. 11AM comes and goes so I check in at the desk to make sure I havent fallen through the cracks. You’re next she tells me. 11:30 passes by and I begin to wonder if she meant I was next to get really pissed off and start yelling at them. Finally, around 11:50 they get me in and strap me into the machine which today is in a room that must double as a meat locker on weekends and it hasnt had a chance to fully thaw out yet. The whining and screeching of the MRI machine put me into a transe and I somehow managed to drift off for almost the entire 50 minutes of the scan this time, which was nice. When it was finally over at 1:10 I headed over to the main campus at 67 & 1st ave. My appointment with Dr Healey, aka Dr Doom, was 12:00..for the follow up and results of the scan. I was not worried in the least about being late for a Dr Healey appointment. I always joked with the nurses there about the “appointment” and ask them why they even bother giving me a time to show up. They should just tell me to show up on Monday and we’ll get to you when they can. That is how it works for the most part. Just like Sienfeld and the car reservation. I dont think they understand the idea of an “appointment”. So I check in at 1 and she tells me it will be at least an hour. I take that to mean I have 2 hours to kill at the very minimum. Since I hadn’t had anything to eat or drink since the night before I head to the cafeteria on the main floor. Surprisingly, the food is halfway decent. I had the sesame chicken with white rice and perfectly done and glazed sliced carrots, in case you were wondering. After lunch I headed to the main lobby of Sloan to sit in a comfortable chair and plug my phone in to charge. Just as I get comfortable with my headphones on I glance over to my left and see this guy that looks very familiar. He sat down 2 chairs next to me when I realized who it was. “You’re John Stossel?” I asked inquisitively. “Yes, I am” he replies. After some chit chat another guy came over and shook his hand and rudely interrupted me. Then he got a phone call which lasted 15 minutes. Just as my phone rang from Dr Healey’s office calling to tell me they were ready for me he got up to leave also. He was going to be very polite and exchange departure greetings with me as he left so I managed to ask him if he minded a picture. He was nice enough to stop for a quick shot. After which I wished him luck with the friend he was visiting. So although I had what I have come to expect as a typical wait for all the appointments for the day, I did have a little bit of excitement for the day. What started out as a miserable Monday was starting to look up. Boy do I remember it like yesterday the somber looks Dr Healey had on his face as he entered the room. I can tell right away this time the results of the MRI are going to be good. He almost has a smile! If you have never met him he can only be described as LOW key..Mellow is his middle name I believe. I think he might work part time as a librarian to let off steam in his spare time. But, when its all good news you can actually see him perk up and crack a smile. The results are good he tells me. No signs of any problems from the MRI. Both his intern and he are still surprised by the range of motion I have considering all the radiation and chemo I had. In fact, everything is going so well he says I only have to visit him in 6 months BUT, I wont need another MRI for a whole year! Whoa!! Wait a minute…as much as I am excited not to have to do this for another year I am also concerned about waiting that long. I suppose a year will pass before I know it so it wont be that bad. I’ll have to come up with another word besides “Scanxiety” because there will be a whole new form of it between scans wondering if anything is going on inside that ugly scar. For now I will just bask in the glory of good news from Dr Doom himself and thank my lucky stars things are going the way they are. Lets keep the ship on course! Now all I can do is wait til next month and hope the CT Scan of the upper body is just as good! 2 years ago today I was headed to Memorial Sloan Kettering for my week long stay. Looking back I must say I really miss it. I got to relax because I wasnt able to move my leg for over a month. I got room service every day. I got to meet a new roommate that did nothing but talk and yell in a very loud voice ALL THE TIME. When I think about it there is nothing but fun! I got to do whatever I wanted to do as long as it involved lying down in a hospital bed for a week. No sitting up, no turning on my side, no moving. And once you make it through the week here you get your very own hospital bed to take home with you because we can tell you love it so much! Just sit in it at home too! Be sure to keep your leg HORIZONTAL, but only for a MONTH! After that learning how to walk again won’t feel too awkward, you’ll pick it up in no time! Who wouldnt want to do that? Ahhh, good times! When its put into perspective of saying do all that and we’ll let you live, then the trade off seems like a good deal. So truthfully, it wasnt all that bad considering the alternative. This is just a quick update on what has become one of the greatest dates in my lifetime. Only December 7th and July 7th might be able to top it. 2 years is a significant milestone for this type of sarcoma. I know, it doesnt mean bells and fireworks go off signaling the all clear and I dont ever need to worry about it again. Sloan has a great reminder program that automatically makes you think about it every 6 months. After you stay with them for a week you earn Bonus Visits with their rewards program. It includes free visits every six months so they can give you the thumbs up or thumbs down to go on with your life or not. As great as it is, I wouldnt recommend signing up. Don’t repeat yourself, or say again what you have said before. Don’t use commas, that, are not, necessary. Don’t never use no double negatives. Don’t be redundant; don’t use more words than necessary; it’s highly superfluous. Don’t indulge in sesquipedalian lexicological constructions. Where were you April 15th, 2013? One year ago today my name changed. Almost one year prior to that I met with Dr. Healey for a long discussion about what to expect after the knee surgery. After explaining what he did to remove the tumor and telling me about other experiences he had with similar sarcomas he started spewing all sorts of statistics and percentages about other people he had operated on. He seemed to think things did not look very good for me at the time. “you’re going to die from this” are words that kinda stick in your head for while. He suggested doing chemo ASAP, however the wound from the surgery had not healed quickly enough to get started right away. (Thanks Radiation!) Even if I could start that day I seem to recall him thinking the chances of chemo working were somewhere in the range of about 5-6%. The longer I waited to start chemo the greater chance to metastasize and cause an entire new set of problems. Start too soon and the surgery would never heal. “you’re in a pickle” was the medical term I believe he used. A few days later I met with Dr. Gounder, the Oncologist. His outlook was quite different. “”You’re going to be fine” and phrases like “soon you’ll be back to normal” flowed out of his mouth like it was just a bad flu or something. He wasn’t sure where Dr. Healey was getting his info from and strongly urged me not to worry about what Dr. Healey told me. So, I had that going for me. I don’t know about you but when I was first diagnosed with this crap I started envisioning all these doctors and huge teams of people in white coats, scientists in lab coats, people in suits from drug companies and teams of others sitting around in a conference room discussing MY case. They’re pouring over records, pencils in their mouths, staring at clipboards and charts and every medical study ever done on sarcomas trying to figure out how best to treat ME and ONLY ME at the time. But no. My two doctors never even gave the impression they met face to face to talk about me. MAYBE they exchanged an email or two at best. So when I asked Dr Healey if they ever talk to each other about it he said yes but it doesn’t mean we agree. That meant for 2 years I have “You’re going to die from this” and “You’re going to be fine” battling it out in my head. Finally, one year ago today Dr. Healey showed signs that there was the possibility of coming over to Dr. Gounder’s side. Dr. Healey was the one I hated to see when I went for the scans every 3 months. I just wanted to get in, get scanned, get the results and if everything was OK I just wanted to leave. But last year the words came straight from his mouth that I could be called NED! (No Evidence of Disease) Dr. Gounder had been calling me NED for a few months already but to hear it straight from the guy that once tells you you are going to die is such a giant weight lifted off my shoulders! I remember after I left his office I walked all the way from Sloan at 67th and 1st Ave all the way to Penn Station at 34th and 7th before I realized it! Normally its a cab ride or subway but I didn’t care this time. I just started walking and didn’t stop I was so elated. 11 Days from now it will have been 2 years from the surgery. What a Long, Strange Trip It’s Been. It still seems far from over but certainly seems as though I may have made it over the hump. The scanxiety at the next scans will probably be high in June. Those will officially be results of the 2 year mark which is a giant hurdle to get over in terms of recurrence and survival rates. Until then, continue to call me NED please! Or you can call me Ray, or you can call me Jay…..but ya doesnt has to call me Johnson. 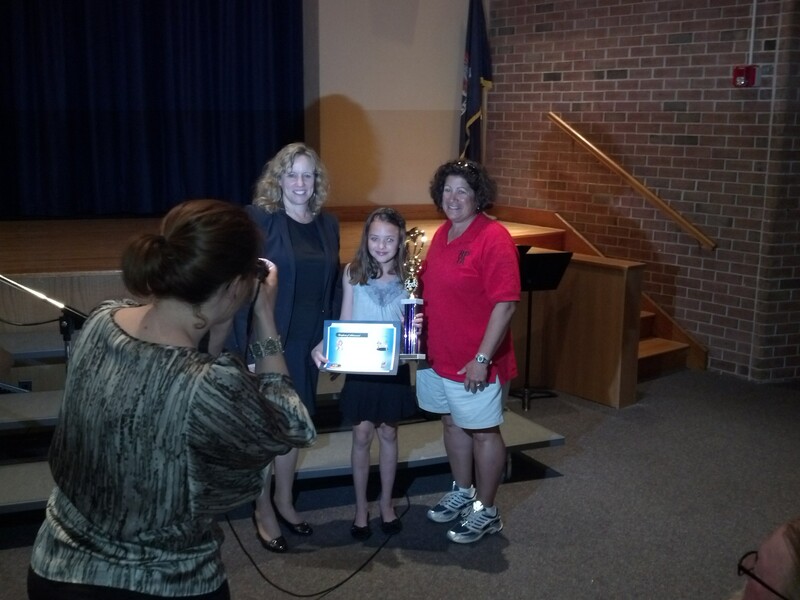 She got a trophy and recognition at the school board meeting this week. Yes, there is an auditorium full of people behind me and the lady taking the picture. So, Thank You again! In other news I have decided to raise money for another cause….have you seen the utter destruction being done to cakes? That second cake, I think it may be a Red Velvet is just a tragedy! For some reason this is one of those really stupid commercials that cracks me up. Cake is by far the most under rated desert so I thought I should bring some attention to it. Ice Cream gets all the spotlight, especially in the coming hot summer days so please remember to help support your local cakes, in particularly, the chocolate cake with a heavy layer of white frosting!